San Antonio International Airport (IATA: SAT, ICAO: KSAT, FAA LID: SAT) is an international airport in San Antonio, Texas, that serves the Greater San Antonio metropolitan area. It is located in Uptown Central San Antonio, about 8 miles north of Downtown. It has three runways and covers 2,305 acres (933 ha). Its elevation is 809 feet (247 m) above sea level. SAT is located in class C airspace. SAT averages 260 daily departures and arrivals at its 25 gates, which serve 12 airlines flying non-stop to 53 destinations. These destinations include 47 in the United States, five in Mexico, and one in Canada. The airport’s top-ranked destinations are Dallas, Houston, Las Vegas, Chicago, Baltimore, New York, Los Angeles, Phoenix, Atlanta, and Washington, D.C.
San Antonio International Airport has two terminals with an overall 24 jet bridge gates. The original one-level terminal (formerly Terminal 2) opened in 1953 with ground-loading holding areas and was expanded twice, once in 1959 with new east and west wings, and again in 1968 with an eight-gate satellite concourse, which was built to handle visitors to HemisFair ’68. Terminal 2 closed on November 9, 2010 as the new Terminal B opened, and Terminal 2 began to be demolished in March 2011, with completion in January 2012. A second terminal (formerly Terminal 1, now Terminal A) opened in 1984 with a 16-gate concourse. The U.S. Customs Federal Inspection Station (FIS) is located in Terminal A and is accessible from Gates A6-A9. 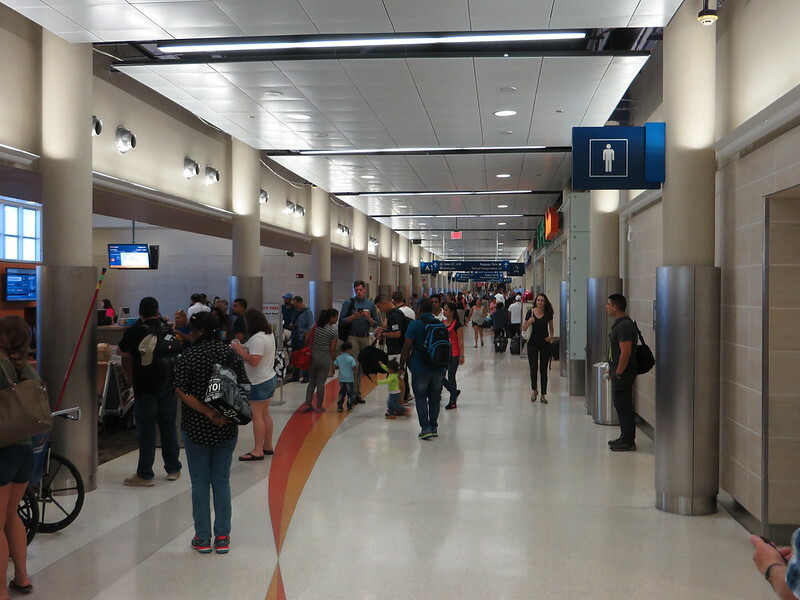 Terminal A will soon begin going through an updating and modernization project. Image published by Ken Lund on 2016-07-07 04:23:24 and used under Creative Commons license.